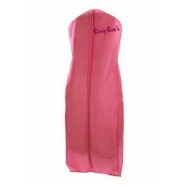 Modern strapless chiffon dress with a plunging sweetheart neckline and sheer inset. The neckline is embellished with iridescent stones and the bodice is gathered toward the center. Back zipper closure.